Lois’ face is now all cleared up. She has just a tiny scar at the angle of her jaw. Apparently what happened was the bloomin’ grasshopper came down like a dive-bomber, colliding with Lois, leaving a small piece of one of its legs embedded in her cheek. She thought she got it all out right away, but probably did not. As a consequence, she developed an abscess at that spot, so compressed it and compressed it some more. Finally, Roy opened it up, stuck a tiny clamp inside and managed to get the core out – following which it healed up rapidly. I’m glad that Alain finally sent you the Xmas present, but golly, I didn’t give him enough money to get you such a regal present as you describe. Maybe he was trying to make up for the delay. 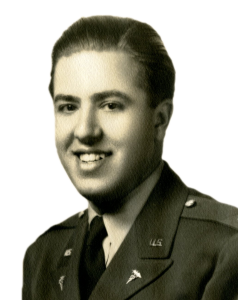 The other day turned out to be not such a good day, so we did not swim, just loafed around and took things easy – wrote a couple of letters, had showers and then spent most of the evening talking with Roy Cohn. He was telling us about India and his experiences there – in general discussed a lot of things, having a very interesting evening. Yesterday was a nice day, but we had to both work. Last night, Lois and I played bridge against Collie and the Col. They won the first two rubbers, but we made a comeback in the end and beat them. In the fall of 1942, René sent money to Alan Dreyfus, his French cousin living in New York, so he could buy a Christmas present for René’s parents. 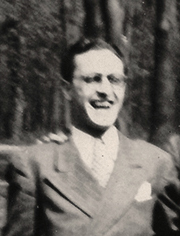 But that present (we don’t know what it was) didn’t reach René’s parents until sometime in the spring of 1943. René and Lois spent most of one evening talking with Roy Cohn and hearing about his experiences in India. 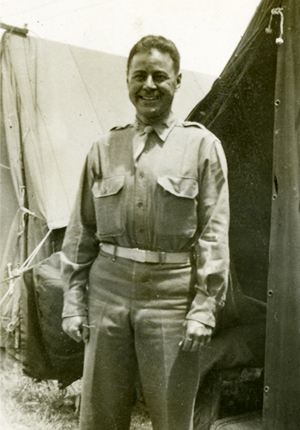 As a Rockefeller Foundation Fellow from 1939 to 1941, Roy helped establish a major hospital in Bombay, India. Last night René and Lois played bridge against Collie (Major William Collie) and the Col. (Oral Bolibaugh) … and beat them. 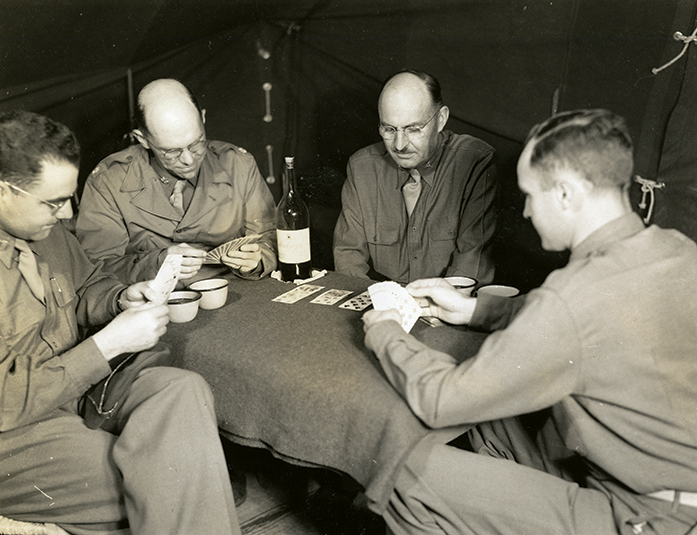 In the photo above, Collie (second from the left) and the Col. (third from the left) are playing cards with George Armanini (far left) and another member of the 59th.